The story of a son's love and a mother's relentless will to survive. Andrew is a very intelligent man, fluent in eight languages and a recipient of dual university degrees in Biology and Geography. He is full of pride for his beautiful country of Uganda. Andrew’s love for geography drove him to leave his small village to pursue employment as a surveyor. His work afforded him the ability to travel from border to border, experiencing all the wonders that Uganda has to offer. One day, when news that his beloved mother, Prossy, fell ill, Andrew knew it was time to give up his dream job to give back to the woman who gave so much to him. Trading in his city dwelling in Kampala for a temporary structure of sticks and leaves in a remote Ugandan village, Andrew was home at last. Upon returning to his roots, he realized that his mother had been debilitated by jiggers, the world’s smallest and most hostile flea. Jiggers measure less than one millimeter in length, but once they burrow into the skin of an involuntary host and reach a blood source, they swell to the size of a green pea and cause unimaginable discomfort. Jiggers attacked my mom, and when I went to care for her, then even attacked me. While having a few feeding jiggers is itchy and painful, an infestation is physically, financially, and socially crippling. In fact, many people in more remote areas of Uganda do not realize that jiggers are a parasitic insect. 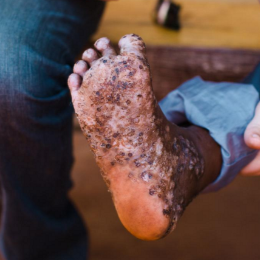 Instead, they believe the recognizable symptoms to be a curse and often shun those suffering from jiggers. In addition to the social stigmatization, it becomes difficult to care for yourself. Those suffering from extreme cases of jiggers, also known as tungiasis, become unable to work or feed themselves. Andrew explains further: “You cannot go to the garden to dig and get food. You lack money because you cannot work well.” This ultimately leads to poverty and hopelessness. For six years, Prossy suffered from the isolation, hunger, and poverty onset by these tiny, unwanted parasites. For a majority of the six-year period, she was bedridden and on the rare occasion Prossy would venture out, she would be seen doubled over and limping, able to walk only with the assistance of a walking stick. Andrew also felt the impact of his mother’s ailment. As he tried to heal Prossy without proper knowledge or tools, Andrew himself lost his business, his home, and his health to jiggers. Andrew’s son paid a visit to Jinja and was startled to see his father and grandmother in such a state of despair. Luckily, Andrew’s son was familiar with Sole Hope’s mission of eliminating jiggers in Uganda. He recommended the family journey to Jinja, a city nestled on the coast of Lake Victoria and the onset of the Nile River, and home to Sole Hope’s Outreach Center. Once arriving at Outreach Center, Andrew and Prossy knew their lives would be changed for the better, forever. During their stay, all of their jiggers were removed. As their wounds healed, their health and hope was restored! Two weeks after arriving in Jinja for treatment, Andrew and Prossy loaded into a van and returned home to their village. Neighbors in the village gathered to receive Andrew and Prossy and were amazed and overjoyed to watch Prossy ease herself to the ground where she proudly stood, smiling. After a few moments, she was overcome with joy and began to dance. Prossy danced in the street like nobody was watching, celebrating her newfound freedom after six years of suffering. When her display of hopefulness subsided, for the first time in a long time, she welcomed her community into her home. Together, Prossy sat, smiled, stood, and danced with her neighbors, sharing her story of healing and destigmatizing the illness that had lay claim to her life for so long. Today, Andrew and Prossy live in good health and no longer fear isolation. While there is still a lot of work to be done, they have a means to provide for themselves with the goal to break out of poverty again. They have the tools and knowledge to remain jigger-free and most importantly are proud members of a community that is invested in seeing them succeed. Story provided by Sole Hope.